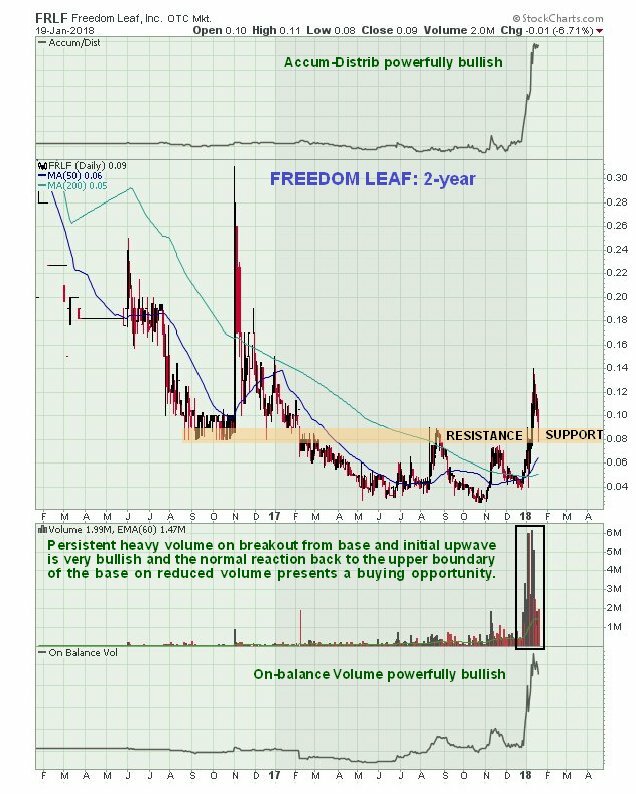 Charmingly named Freedom Leaf was discovered during a scan of cannabis stocks looking for positive patterns. It has a very positive pattern indeed. On its latest 2-year chart we can see that after a bearmarket decline during 2016 and the 1st half of 2017, it went into a basing pattern, and made its final low as recently as October of last year. Then things definitely took a turn for the better with it making a run towards the resistance at the top of the base pattern in November. This failed and it backed off, only to regroup and make a more determined run at the resistance against the background of sector strength around the turn of the year, this time on very heavy volume which drove volume indicators steeply higher, a strongly bullish sign. Now we will look at recent action in more detail on the 3-month chart. On the 3-month chart we can see that it failed again to take out the resistance very early in the year and briefly dropped back hard on the Sessions scare. However, it quickly recovered and then blasted through the resistance on all-time record volume, clearly a valid breakout move. It continued a little higher before reacting back on reduced volume towards what is now support at the upper boundary of the base pattern, which is typical post breakout behavior that throws up a buying opportunity for those who didn’t take positions ahead of the breakout, such as us. The appearance of a hammerlike candlestick on Friday at the support is a sign that the reaction is done and that it is ready to turn higher again. Conclusion: this is a really strong looking cannabis stock, even if it takes a little while to get moving again. 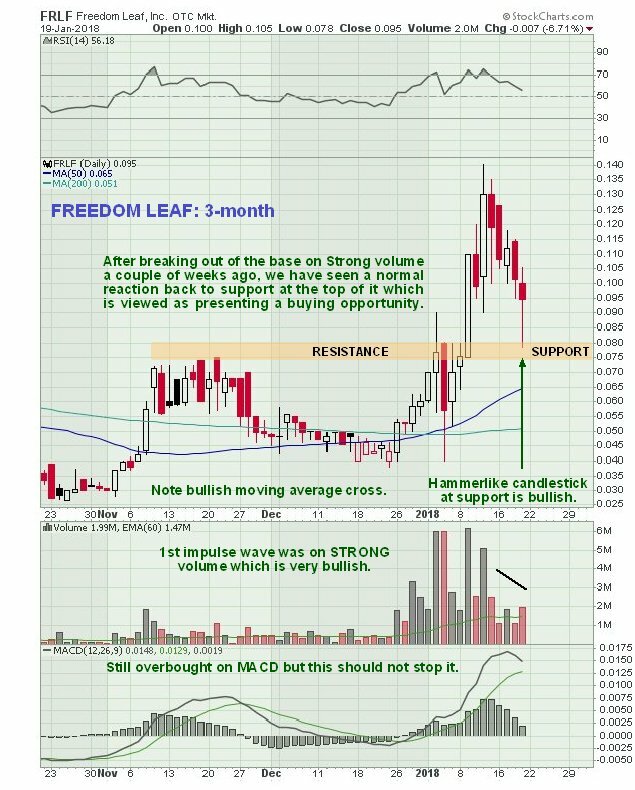 Volume and volume indicators are exceptionally bullish, and we are believed to be at a good entry point here after the reaction back to the support at the upper boundary of the base pattern, and Freedom Leaf is rated an immediate strong buy. The number of shares is issue is a little on the high side at 130.5 million, but certainly not at levels that deter us from taking an interest in it. The number of shares in issue is factored into the low stock price anyway. Freedom Leaf Inc, FRLF on OTC, closed at $0.095 on 19th January 18. Posted at 6.00 am EST on 21st January 18.